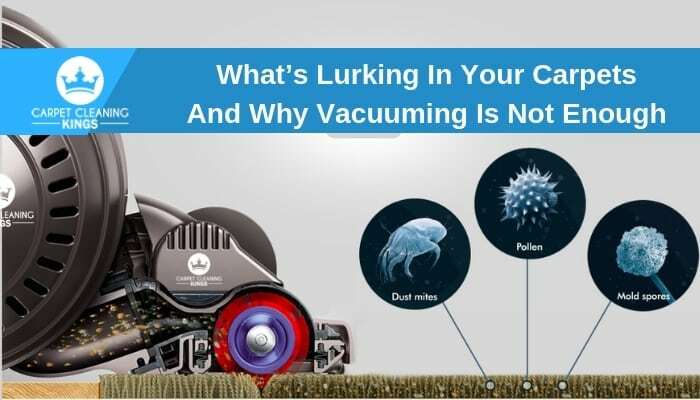 Vacuuming Is Not Enough, What's Lurking In Your Carpets? Carpets fill our rooms with a warmth and coziness that makes it feel ….. well, like home. They add to the aesthetics and make it feel welcoming and inviting. It’s no secret that carpets collect dirt and dust but there’s a whole lot of other things hiding there too. Things such as bacteria, germs, toxic allergens, and micro-organisms can all be lurking in the depths of your carpets. So Let’s take a closer look at some of these carpet invaders. Mould and mildew love nothing better than an environment that is warm and damp and if your carpet is left overly damp by an inexperienced carpet cleaner and takes an age to dry, there’s every chance that mould will start to form on it. If not treated right away it can ruin your carpet leaving you with no alternative but to replace it. In addition, any spills on your carpet should be mopped up and dried as quickly as possible otherwise the liquid can seep through the carpet fibres into the padding below. This can lead to mould forming beneath the carpet which you may not notice. Harmful pathogens and/or bacteria such as salmonella, E.Coli, and Staphylococcus can live and thrive unnoticed within your carpet and cause your family to fall ill.
Carpets can also attract microscopic insects such as dust mites, fleas, and bed bugs. A tell-tale sign that you have fleas in your carpet is when you find that you’ve been bitten on your feet and legs as they jump onto your skin from the carpet. Not only do these bites look unsightly, but they can cause skin irritation and rashes. Fleas tend to live on pets who pick them up from walking in long grass, or from other animals, and unfortunately, they can be transferred to humans. Luckily they can be easily eradicated by using a quality flea killer spray on your carpet and pets. Bed bugs, on the other hand, require a specialised extermination process which is best left to a professional. Dust mites don’t live on humans or pets but they leave behind particles of moulted skin and faeces, which if inhaled can cause respiratory problems or trigger allergies. Both humans and pets shed their hair and skin (also known as dander). Microscopic insects such as ticks, fleas and dust mites are attracted to dander which is a food source for them and once word gets around, your carpets could become heavily infested with insects. Regular vacuuming won’t rid your carpet of all these allergens but it will help reduce the level of dander present. The answer is professional carpet cleaning using hot water extraction. We use heavy duty powerful cleaning equipment which propels jets of water mixed with a cleaning solution at speed into your carpet, reaching to the very base of the fibres. All dirt, grime, and allergens are loosened and extracted along with the dirty water leaving your carpet fresh and clean. Our experienced technicians know just the amount of water to use so that your carpet dries naturally within a few hours. If your carpet hasn’t been professionally cleaned in a while then Carpet Cleaning Kings is here to assist. Give us a call on 1300 7000 75 to request a free quote or make an appointment.